Shares of Tesla Inc (NASDAQ:TSLA) have taken a beating over the past couple of weeks, falling more about 17% from its June high around $387 to current prices around $320. A combination of factors, including a broad recent selloff in tech, has impacted TSLA stock. But doubts about Tesla’s money-making capabilities remain the biggest bearish factor. Tesla critics, who have been skeptical of the company’s financial position and its rate of cash burn, have grown more wary as the company’s Model 3 — which it is launching to compete with Ford Motor Company (NYSE:F) and General Motors Company (NYSE:GM) in vehicle mass-market production — is now closer to reality. Indeed, this is a critical time for Tesla, particularly on the heels of the company’s production numbers falling short of expectations. But this recent pullback also created an opportunity for investors who have waited for a good entry point in TSLA stock. Tesla CEO Elon Musk recently tweeted the first Model 3 to roll out of the company’s Fremont, California, factory. The charismatic CEO not only promised that by the end of this month the first 30 customers would receive their Model 3s, but he said Model 3 production would rise to 20,000 a month by December. 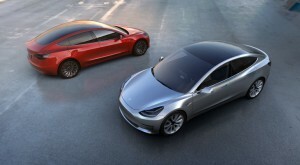 In between, Tesla plans to produce 100 vehicles in August and 1,500 in September. The new vehicle costs $35,000, which is about half the price of Tesla’s next-cheapest car, the Model S. The company believes the lower price point would enable it to emerge from a niche market and become more mainstream. But not everyone on the Street is impressed. Because of increased Model 3 production costs, among other growing expenses, Tesla’s gross margins — already under pressure — won’t get any reprieve. A UBS analysis says Tesla would need $41,000 to break even on each Model 3 at the EBIT level, causing investors to worry about the margins on the lower-priced model. How Should Tesla Be Judged? The bull case for Tesla centers on the company’s ability to disrupt or transcend the auto industry on its way toward becoming the tech behemoth Musk implies it can become. As such, should Tesla be evaluated solely as a car company similar to Ford and General Motors or is the company closer to, say, Amazon.com, Inc. (NASDAQ:AMZN)? If it’s the latter, then it’s a mistake today to worry about profit margins. Indeed, in the most-recent quarter, Tesla posted a wider-than-expected first quarter loss. But despite the miss, TSLA posted automotive revenue of $2.28 billion, which rose 15% sequentially and 123% year-over-year. What was overlooked is the fact that Automotive gross margins came in at 27.4%, marking an improvement of 480 basis points from the fourth quarter, while expanding 340 bps year-over-year. From my vantage point, the gross margin improvement underscores the extent to which Musk has begun to focus on profitability. And Musk, while catapulting Tesla to a market favorite in electric cars, has done this with no traditional advertising such as television. While it’s true the company is racking up debt, much of it is being used for research and development, shoring up its infrastructure and technology that will make it even more difficult for TSLA competitors to catch up and helping Musk to realize Tesla’s potential to become the next great transformative tech giant. Profits won’t come anytime soon, and when they do, the number likely won’t impress the company’s critics. Nevertheless, what’s more important for now is how Tesla can deliver on Model 3 production estimates and boost demand for the Model S and Model X in the quarters ahead. From my vantage point — and judging Tesla closer to Amazon than a traditional auto company — Tesla is operating on all cylinders. As such, I continue to expect TSLA stock to reach $400 by the end of the year, driven by increased enthusiasm for the Model 3. As of this writing, Richard Saintvilus did not hold a position in any of the aforementioned securities. Article printed from InvestorPlace Media, https://investorplace.com/2017/07/model-3-can-propel-tesla-inc-tsla-stock-to-300-by-2018/.